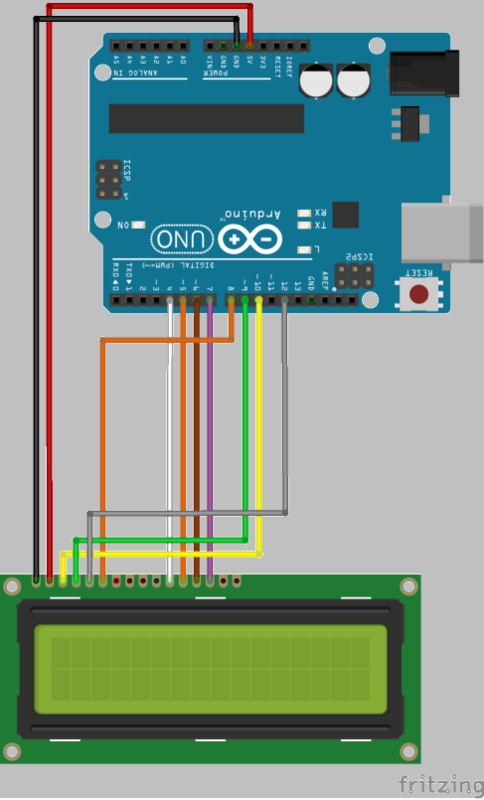 LCDs have become an inexpensive and popular means of displaying status information or for prompting for data input and they are easy to interface to an Arduino. The most popular LCD controller is the Hitachi HD44780 which, apart from being used by various LCD manufacturers in their own displays, is also available in fully plug-compatible chips and displays. Samsung, Sanyo, Epson and OKI all manufacture HD44780-compatible devices. Display sizes include: 16x2, 40x2, 20x4, etc. The HD44780 addressing schema is designed for all sizes of LCD, which means that the start address for each row does not necessarily follow on the from end address of the previous row. A good explanation can be found here. There are websites that show how to connect up LCD devices but there seem to be some displays that require the RW connection in order to drive the display properly. You can download an example program here and the wiring schematic is shown below.